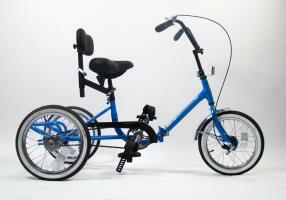 Taking the same design features on our famous adult trikes, we offer TR16 Series of Developmental Youth Trikes. The TR16-FD features a folding frame for easy storage and take-along ability, short frame style with easy step-on, comfortable padded saddle, adjustable handlebars and seat post, rear basket and much more. The sturdy 16"x1.75" wheels give this cycle a low center of gravity for excellent balance. 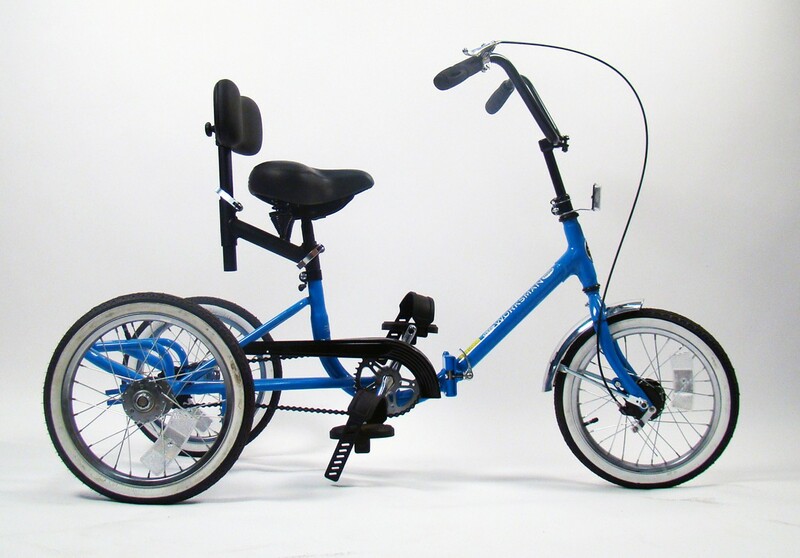 The TR16-FD features a front drum brake and a live axle (Pedals turn whenever trike is in motion, often very important for special needs population). Ideal for children ages 3-8. Ships mostly assembled via UPS. Image shown includes optional 7917t-1 Backrest. Why spend $1000 or more from other vendors when the TR16-FD is an ideal choice! This bike was amazing for our little girl!! She is a normal functioning 8yo child but struggles with balance and core! She was sad to see other kids riding a bike and her not being able to! I found this site online through much re search for her to have from santa this year! Not only was it a huge hit, all the kids want to ride her bike, and she's stopped frequently asking where we got it! I called previously when purchased to make sure it would be here my Christmas! Customer service was great and assured me it would arrive. There are also great videos on YouTube on how to quickly assemble the bike! I highly recommend this company and the bike! It's the perfect fit for kids aged 6-12! Plus you can pick the items you want on it along with the color!! Thanks so much for making my Child's Christmas and great one! My students absolutely love this bike. I am very pleased with my purchase of this tricycle. It is very sturdy, stays balanced in (accidental) sharp turns, and provides a low-impact aerobic exercise. I highly recommend this tricycle. The hand brake was a concern of mine at first, but my students learned how to brake with ease. Excellent customer support. Delivery on schedule. Product is superior and accessories were better than expected. RECOMMED this product for special needs. Worksman does notbleed you for extra $$$ just because it is special needs. Not sure what happened.. but our bike didn't have handgrips for the handlebars.